PURCELLVILLE, VA — There comes a time when almost everyone thinks about owning a country home. If now is that time for you and your family, you might want to learn more about Loudoun Oaks in history-filled Purcellville. The landscape is pristine and picture-perfect with rolling hills and vast stretches of open land. It’s worth touring around on a weekend even if you’re not shopping for a home. The lifestyle is welcoming and relaxed. And the seven, homes we’re building along a private drive off Silcott Springs Road are on beautifully wooded 1-4 acre lots. So there’s plenty of great outdoors for growing families. With a 2-3 car side-entry garage and up to 5100 sq. feet you might be surprised at our preview pricing, too. How does “from the $500’s” sound? Want to know more? 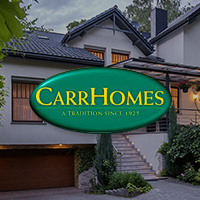 Call Tom West, 703-926-7469 or learn about Loudoun Oaks at CarrHomes.com.